A thoughtful reader was kind enough to point out to me that the URL for the twitter story about Silverstone Golf Course led to a twitter page in Arabic. Totally my fault. I’ve fixed the error. I highly recommend that you read that series of tweets–it gives some valuable insight into the way this developer operates. The developer who purchased the San Ramon Golf Club has requested a meeting with the Steering Committee. There has been considerable controversy surrounding whether the Committee should meet with him at all. Please make your opinion known by completing this brief survey. If you have already done so, thank you. If you haven’t, please do. It will take literally seconds, and there is space for your comments. The results will be tabulated and made available once it has been completed. You can get to the survey page HERE. Activity on the golf course? Questions or comments? Heads up, two trucks in the parking lot at the golf course this morning loaded with fencing. Largely it looks like gates for blocking cart paths. When asked the driver of one of the trucks where it was being installed he didn’t know yet was waiting to hear from the customer. It’s important to keep in mind that the new owners of the San Ramon Golf Club have made no application to the City of San Ramon to change to zoning from its present Golf Course/Agricultural to a zoning that would allow building. This may be part of the work on the riparian habitat that is part of the Faria development. We’ll post updates as we find out more. Questions or comments? Update to my last note…the fencing is to block ALL entrances to the back nine are being gated. Journalist Sam Campopiano has just released a new article about the San Ramon Golf Club and the developers’ plan to build homes on the 125-acre site. If the city of San Ramon does not change the zoning of the San Ramon Golf Course to allow the new owners to build housing on part of the course by the end of the month, the new owners have pledged to close the golf course for good. This is nothing new. Many are, frankly, surprised that the course is still open. Richards and Schlesinger want the city to change the zoning from “agricultural” to “residential,” so they can build housing on the golf course. 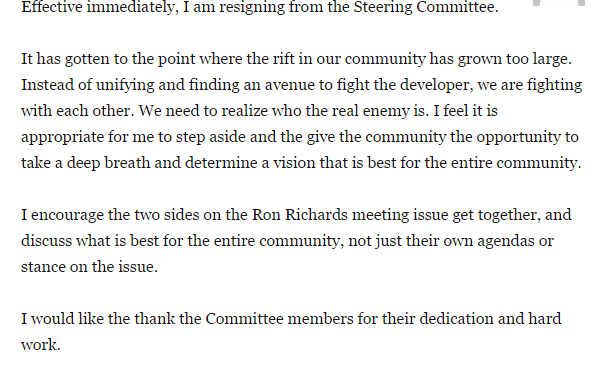 If the city council fails to meet their demands, Richards and Schlesinger pledge [to] chain off and close the course indefinitely. The article is a must-read for all San Ramon residents, not just those who live close to the golf course. To put this into perspective, there are 26,000 homes in San Ramon. Of these, 18,000 are homeowners. There are 325 homes that look out on the golf course, and twice as many in immediate proximity (across the street). If the site were to be developed, the homeowners whose backyards abut the course would lose value–I would estimate around $20,000 for each home because their neighborhood and views would change (I am speaking as a real estate broker and mortgage lender here). Of greater concern–and this affects everyone in San Ramon–is the effect on traffic and infrastructure. Regardless of any promises the developer might make about schools and parks, the effect on traffic would be significant, especially on Alcosta, San Ramon Valley Boulevard, Broadmoor, Pine Valle Thunderbird and Sedgefield. These are all residential streets that cannot be widened to handle the additional traffic. Ultimately, these effects would extend to ALL San Ramon residents. The San Ramon Golf Club property is zoned Golf Course/Agricultural. That is written into the General Plan. The only way that could be changed to allow building would be with a 4/5 vote of the City Council AND of the Planning Commission. Failing that, a ballot measure, which would start with a petition. There are no other avenues for these developers to build so much as a doghouse on that land. It is more important than ever that we all stay aware and involved. You can do your part by urging every other resident of our city to subscribe to this site. Read Sam Campopiano’s excellent article HERE.